We are cooking a lot of high carb meals this week because it's football camp for Trevor's high school. That means 5 hours per day of weights, running, hitting, and running some more, so he needs lots of calories. I saw this recipe in Southern Living and thought it would be perfect. First it is part mac and cheese, which Trevor loves. 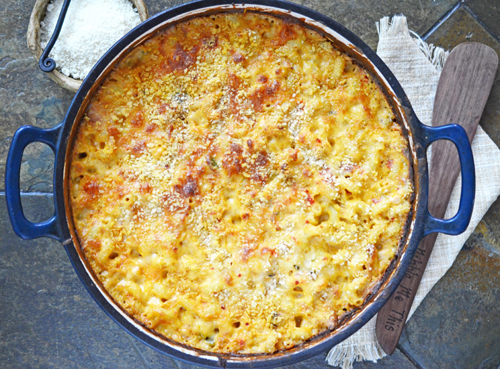 The second part is King Ranch chicken - a cheesy, gooey, and comforting Tex-Mex casserole. The two together had to be a winner, right? The added benefit is that this recipe only requires 20 minutes hands on. I made a few changes of course, the first being that I cooked it on my Grill Dome kamado grill. I also did it in one skillet instead of two dishes like the recipe called for. I wanted mine to be a little more "Tex-Mexy" (...."Tex-Mexish"?) so I used Mexican crema for sour cream and added some of my fajita dry rub. Instead of cheddar, I used Queso Chihuahua with Jalapeno for a bit more kick. Chihuahua cheese is a mild, moderately soft cows milk cheese that melts nicely, making it ideal for cheese sauces like fundido. I already knew that, but what I did not know is that, according to Cheese.com, it was originally made by Mennonites, which is why it also goes by Menonita. If you can't find Chihuahua cheese, you can substitute a pepper jack cheese. Preheat your kamado grill to 325°F. 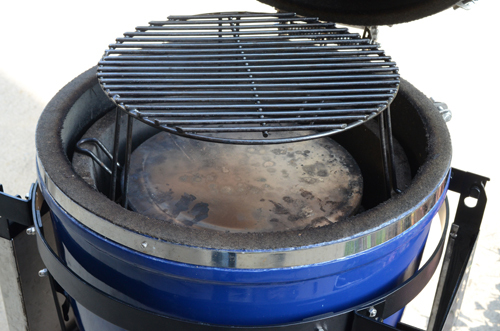 Initially it should be set up for direct heat with a regular cooking grate set on the top of the fire ring. Once the grill is preheated, place a large, grill safe skillet on the grate and let it preheat for 5 minutes with the grill lid closed. Add the butter and oil to the skillet. 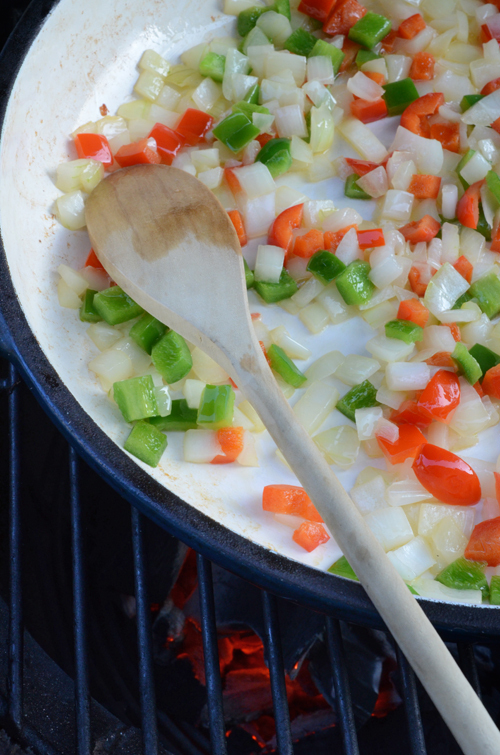 Saute the onion and peppers for 5 minutes. Season with the fajita or taco seasoning and continue cooking until tender, another 1-3 minutes. Stir in the RoTel and Velveeta and cook, stirring frequently, until the Velveeta melts, about 2 minutes. Stir in the chicken, soup, crema, chili powder, cumin, and about half of the shredded cheese. Sprinkle with remaining cheese and panko bread crumbs. Switch the kamado to indirect heat (see pictures) and place the skillet on the Grill Extender or other raised rack. 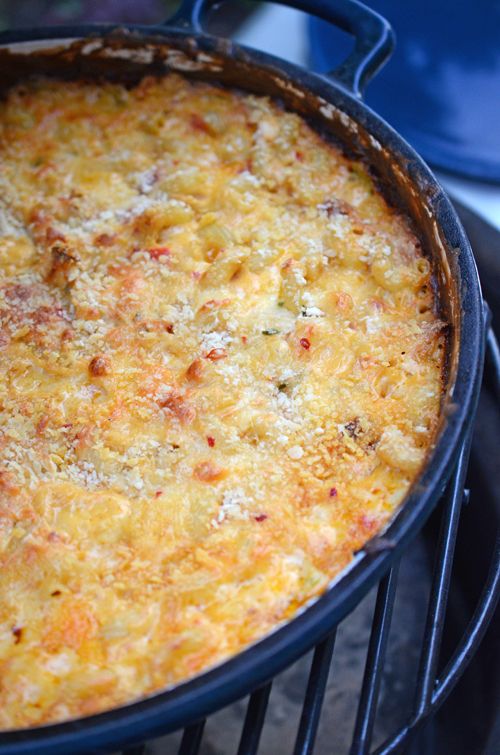 Bake at 350°F until the top is golden brown and the cheese is bubbly, about 40 minutes. Remove and serve topped with Cotija cheese if desired. 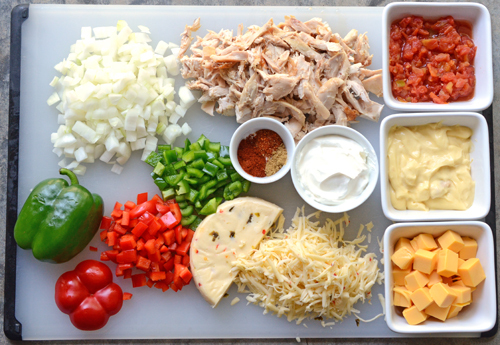 Mise en place - this recipe goes pretty quickly so have everything ready. I used a 13" cast iron skillet but you could use a deep 10-12 inch skillet, a Dutch oven, or stoneware casserole dishes. When frequently opening your grill lid for kamado grills, your cooking temp will rise because you're letting more air in. 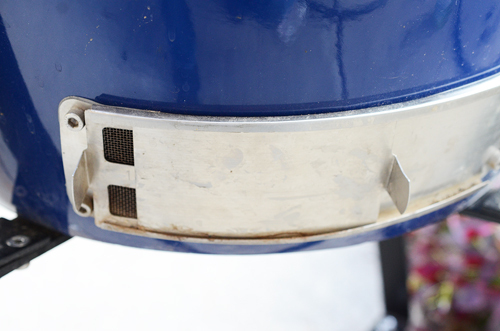 Cut your bottom vent to about half of what you normally would have it set for 350°F. This will help keep your temps from getting away from you. Cooking over coals adds more flavor than cooking stove top. Here are some tips for "stove top cooking" (saute, stir fry, etc) on your kamado grill. The frequent opening of the lid can let too much coal to ignite but these simple steps will make it no problem. 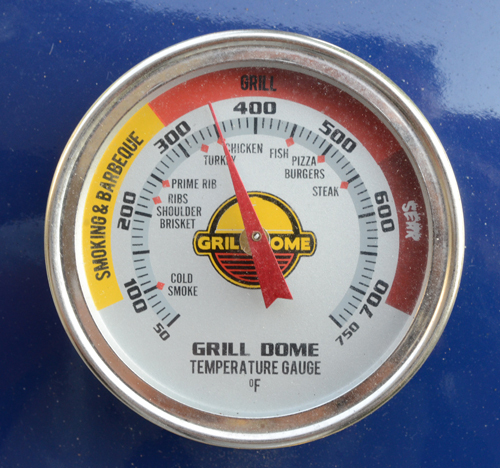 Start with a lower temp then your desired cooking temperature as it will get hotter every time you open the grill. Close down the lower vent while you have the grill lid open. Just don't forget to open it back up when you close the lid. Burp frequently. It's easy when frequently opening and closing your kamado to create conditions (heat, fuel, limited oxygen) for a back flash. 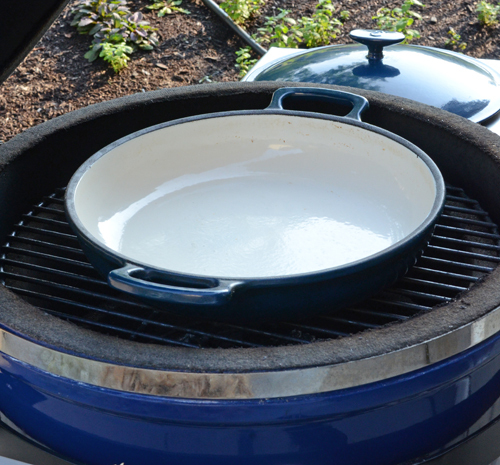 "Burp" your kamado by slightly opening and closing the lid a few times quickly to re-introduce air to the equation. 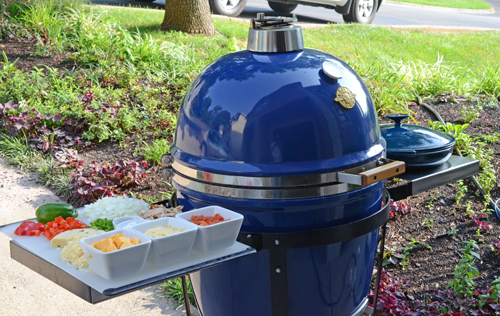 Here is the indirect set up for the Grill Dome - Indirect Rack, stone, and Grill Extender. Once you are finished sauteing and are ready to bake, your grill should be close to 350°F. 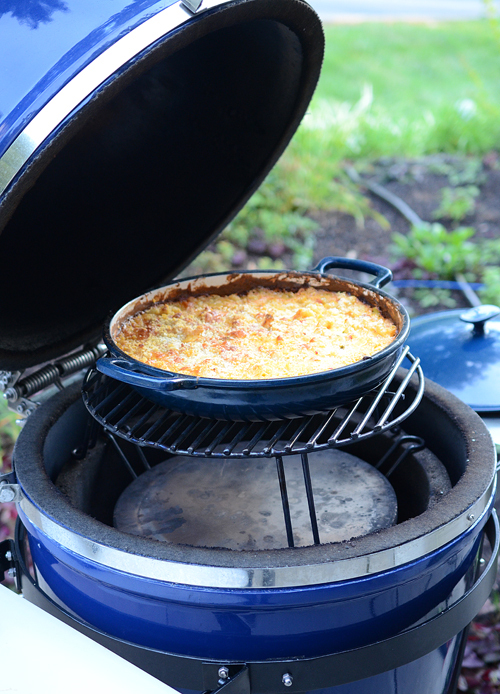 The reason for putting the casserole higher up in the grill is to harness the power of the Grill Dome's great ceramics. The heat reflects down off of the Grill Dome's dome and browns the top evenly. This also keeps the bottom from burning. This one is a winner and we'll make it again. I held off on adding a chopped chipotle because I didn't want this to be too spicy but next time I'll throw that in too. This is also my last cook having to cook out front. The weather finally cooperated and we got to finish pressure washing, sanding, and staining our deck. [Standard FTC Disclosure] We are proud to have Grill Dome as our kamado sponsor!